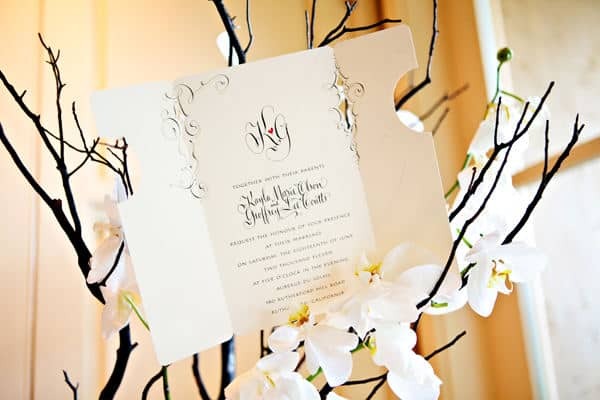 Recently we helped design a custom invitation suite for a Napa Wedding using Maria Thomas Folio Design Invitations. Maria M. Thomas partners with Checkerboard to create beautiful Hand Lettering printed on High Quality Papers. 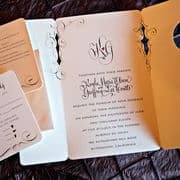 Maria M. Thomas custom designs the Monograms and motifs and Checkerboard creates a plate then uses offset printing to print the design on heavy weight stock created using two thick sheets laminated together resulting in a creamy luster and beautiful Stationery. The results are below: Fine Hand Lettered look for a beautiful event. Our clients Kayla & Geoffrey’s Custom Invitation Suite for their June Wedding in Napa Valley at the upscale Auberge Du Soleil Hotel. Custom Wedding Invitation with Hand Lettered Monogram in Die Cut Window. The motifs around the window embellish the couple’s Monogram. 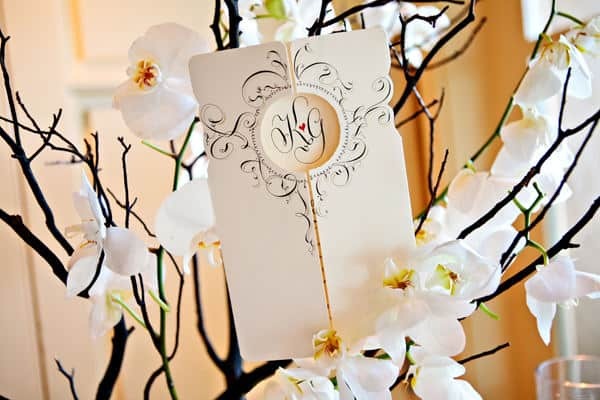 The orchid’s branches compliment the design in the Wedding Invitation. Custom Folio Wedding Invitation open view. The motifs designed by Maria Thomas for Chekerboard overflow into the open flaps of the invitation creating a uniform design adding to the charm of this invite. The beautiful programs we created with the Maria Tomas script honor the traditional Wedding Program where guests can be informed of the upcoming day’s events and once again witness the couple’s names united as a symbol of their Marriage. Invitation suite complete with Wedding Invites, Rsvps, and Directions card ~ The stationery set is inviting because the Maria Thomas script design with Chekerboard printing and cream stock is uniform in it’s design and creates a complete look for the entire invitation set. 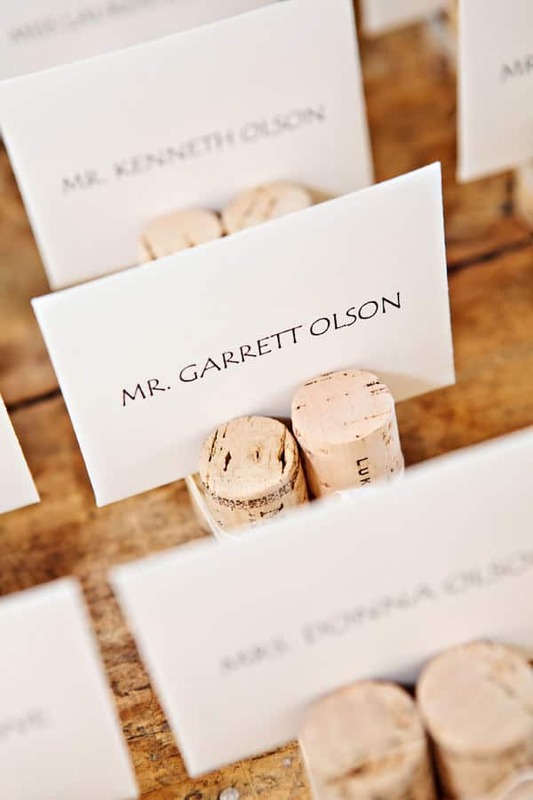 Custom place cards inserted into two sets of cork holders with tied ribbons. 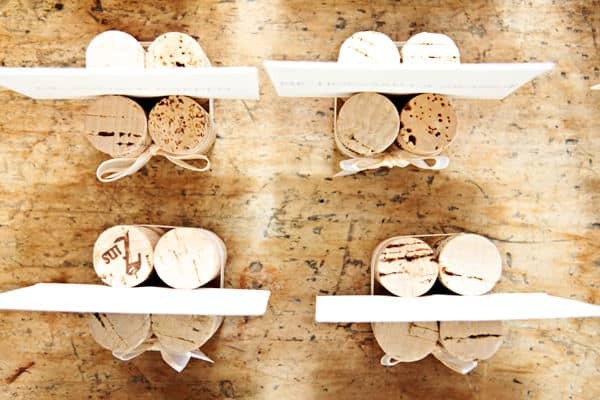 Adeline & Grace photography capture the detail of the wine corks adorned with the seating cards and ribbons in this shot. 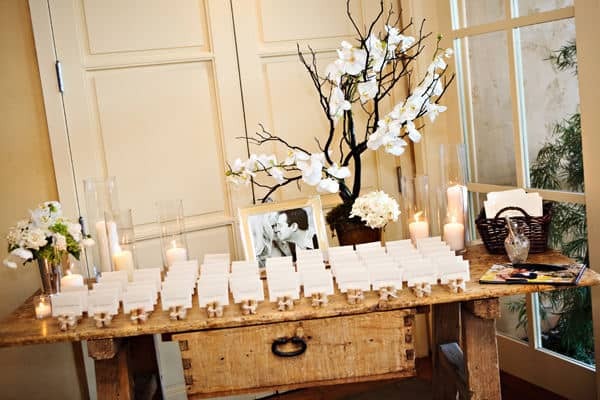 Here the event planner created an appropriate look utilizing wine bottle corks as place card holders since the wedding was taking place in the world renowned Napa Valley California and at the Luxury Hotel Auberge Du Soleil. 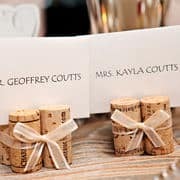 Place Card Calligraphy printed by Jacuqes Oskanian owner of www.Hyegraph.com using Digital Calligraphy with matching font style with the couple’s invitation suite. 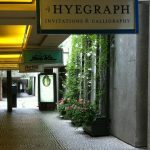 calligraphy by Hyegraph Invitations. Close up view of the Digital Calligraphy used to print the custom place cards for the event. Response card with trendy icons used for Entree Choice including meat, fish and vegetarian menu choices. 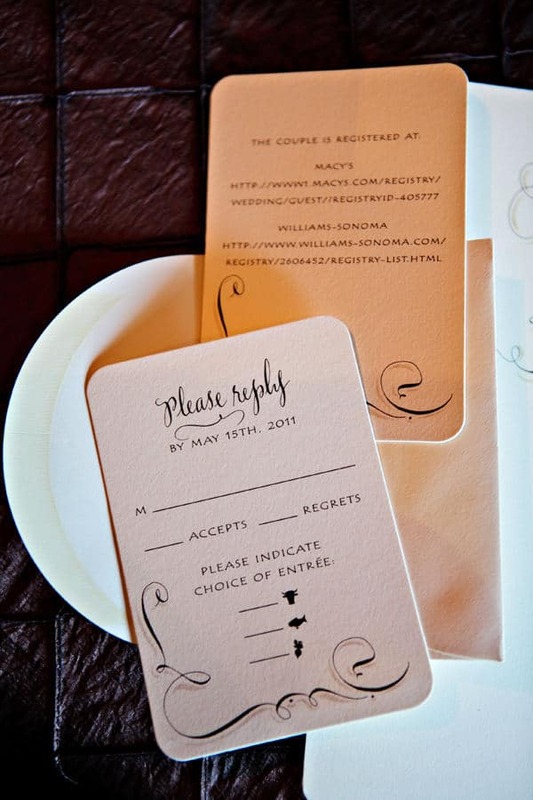 Hyegraph created this clean and fun look with entree choice icons to save space and make the rsvp information easy to see and mark for the couple’s guests. Weddings and Events can be fun and festive with the right budget, location and professionals to ensure a beautiful and memorable event. In this case the couple had a sun kissed breezy wedding at the luxury Auberge Du Soleil, their memories captured by Adeline & Grace Photography and invitations, place cards and programs by Hyegraph Invitations and Calligraphy. 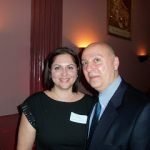 Make your next event a fun and memorable one! Kayla & Geoffrey’s Wedding was featured in the “Style Me Pretty” Blog. Thank you for considering Hyegraph for your Wedding Invitation Design. Wow! It’s so beautiful. 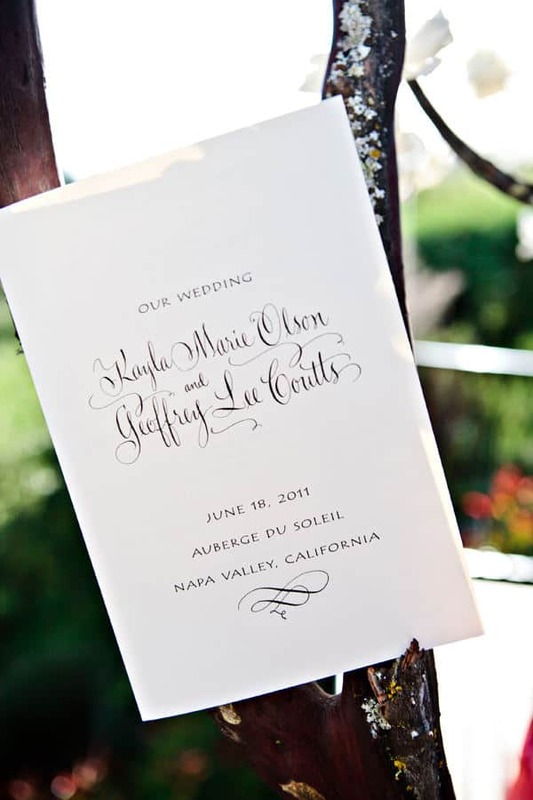 I admire the Hand Lettered Monogram in Die Cut Window and that gives it an elegant look for the invitation. Thank You George for your lovely comments on our Custom Wedding Stationery. The clients loved their invitation suite. Thank You Krish for your kind comments!